Most of my beach sunrise pages use stencils, stamping or some other DIY technique to achieve the colors I desire. Finally I stumbled upon a collection that looks lovely with the colors of sunrise. This is a fall collection from Fancy Pants and it is perfect as the photo was taken on Halloween. For the page, I also used some sequins and one of the sketches from the 2016 Sketchbook. It has been ages - maybe years - since I did a card challenge but I wanted to do something a bit different this weekend. 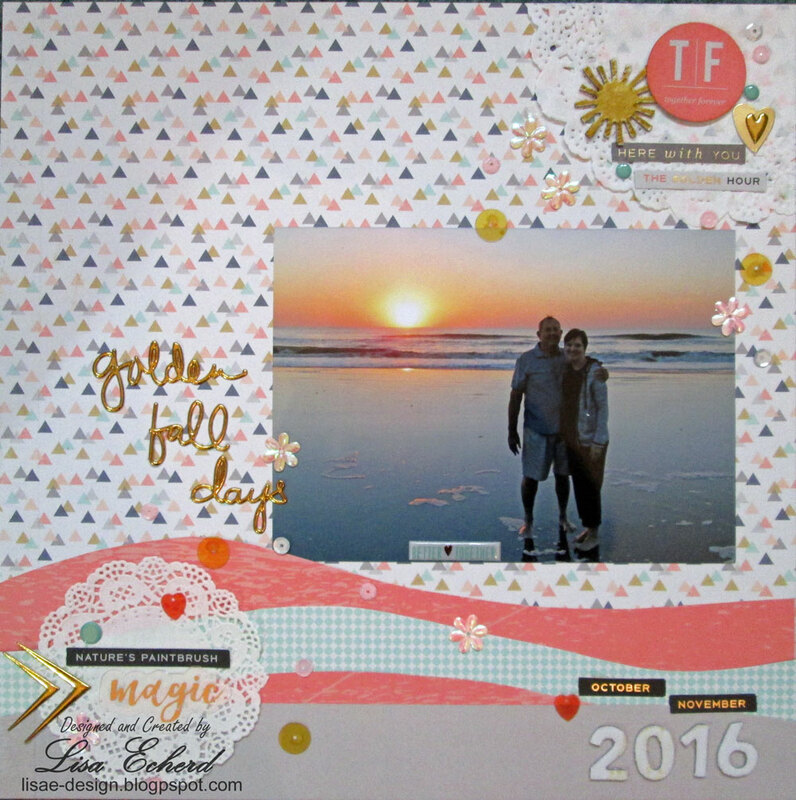 I took the Inspiration Challenge from Splitcoaststampers. The inspiration came from a Pinterest board. One of the pins had several Ranger ink colors. I had two of the 4 and subbed in the other 2. 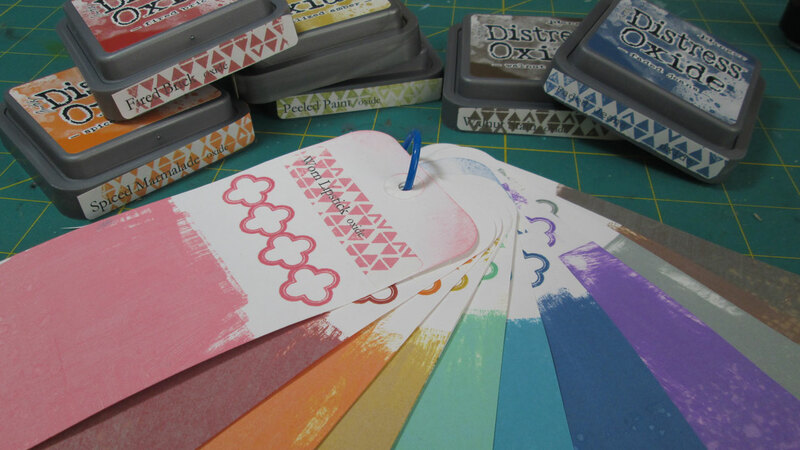 All of theses are the Distress Oxide Inks. To make the card, I started with some bookpaper. Packs available on my Etsy shop. I stamped and embossed a background image and then put the inks on my craft mat. I added water and dipped in my embossed bookpaper. The flower is from Wild Orchid Crafts and it also got a good dose of Distress inks in Fossilized Amber, Marmalade, and Vintage photo. The greeting is Stampin' Up! 's Year in the Life set. I also made a scrapbook page this weekend with video so I'll have that up soon. Thanks for visiting today! I was recently asked on YouTube to do a video showing an entire album. I've been asked about what I use on the back of pocket page layouts. 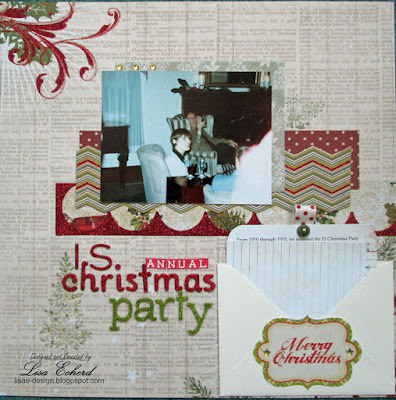 I also had a question about cutting out the page protector to reveal hidden journaling tags and such. What good questions! So for this video, I flipped through the 2016 album and shared the answers to those questions as well as what album I use, the order of the layouts and my front and back pages. You've seen most of these layouts. A couple of them were class layouts but most everything else was from regular videos released last year. I appreciate the questions and comments. If you have asked a question that I did not respond to, please ask again. I get emails from YouTube for most of the comments; however, I just found out that I don't get emails for ALL the comments. I don't know why but I found out where to see all my comments without having to go to each individual video. I'll be sure to check that in the future. Every year for at least 5 years my husband and I went to a departmental Christmas party in the early 1990's. We looked forward to this event. It was always a fun night with good company and food. I found this one photo of us and I don't even know what year it was. It was situations like this that prompted me to write the PDF, "No Photo, No Problem" a couple of years ago. The 34 page PDF contains 17 layout examples on creating pages when you have few if any photos to go with your story. The PDF has a bonus 45 minute accompanying video sharing how many of the pages came together plus techniques. More information is here. For this page, I created this process video. Be sure to check out the last few minutes as I share a little about what is going on and what to expect from my videos in 2017. Thanks for watching and as always I love to get your feedback. 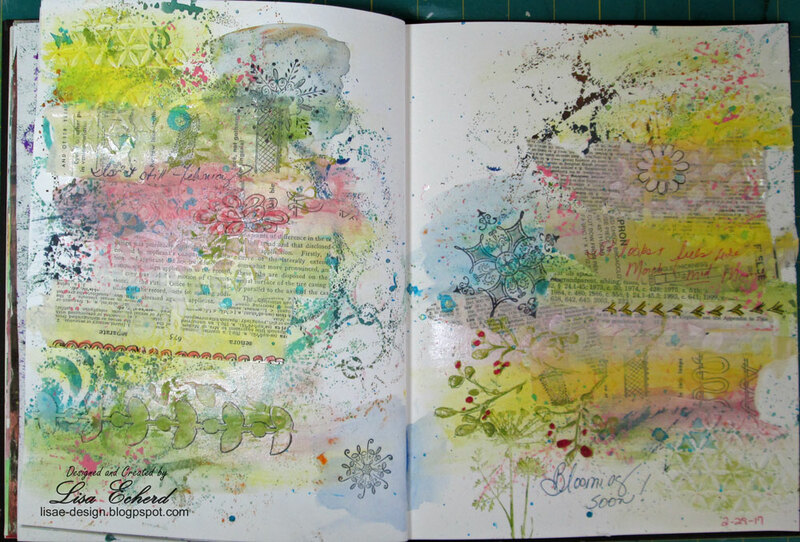 It's been months since I worked in my art journal. 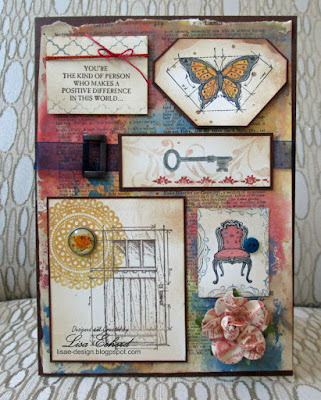 I needed to have a little play time so I did this spread with some bookpaper over stenciled designs, modeling paste and paint. 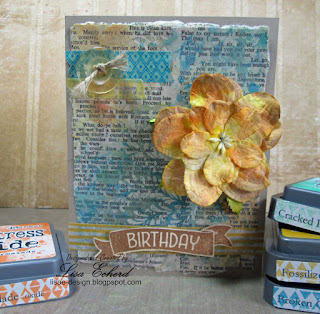 I've also added some stamping. 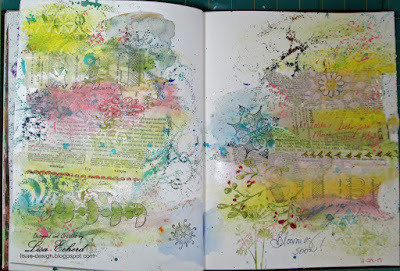 To get inspired, I quickly browsed my Art Journaling board on Pinterest. The link is in the description for the video. I can not say this is the prettiest page I've ever done but it was fun to do something free and easy.